Surrounded by forest foliage, the retreat offers various amenities to aid the success of every event at the venue, including a 25-foot outdoor/indoor projection screen, a 72-inch touch-screen television, pedal boats and kayaks, Wi-Fi, surround sound, adult and children’s bicycles and tricycles, and more. Whether you want to host a corporate retreat, have a relaxing getaway in the country, broadcast webinars set to a tropical background, or celebrate family with a wedding, family reunion or birthday party,The Grandma Home House Retreat has everything you need to celebrate, teach and relax. Now you can use your Apple devices to share your experience with loved ones via Apple TV. I was very impressed when I drove up. The first thing I noticed were the palms trees, the sand, and the gazebo. 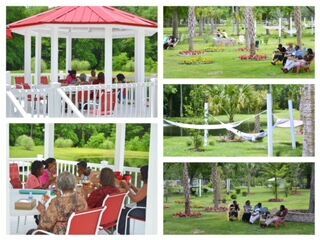 The Grandma Home House Retreat has two Certified Event Planners to assist with all of your event needs, including planning, sound system setup, catering, and more. Each Retreat personnel is CPR/First-Aid certified, and there is a certified Water Safety Instructor on staff. All of our five deluxe beach bungalows have the same spacious design and offer a lounge, dining area, kitchenette and a large covered deck facing the aquamarine lagoon, in a style that captures the romantic, ‘retro’ atmosphere of the old 1940’s South Seas.